Cyber Monday can be thought of as the online equivalent of Black Friday, which is a worldwide sales event that is notorious for its steep discounts and gigantic crowds. The event is observed the Monday following U.S. Thanksgiving in late November to early December. In 2017 alone, the worldwide shopping extravaganza generated a record $6.9 billion in sales in the U.S.A. alone – a figure that keeps growing each year. The actual name “Cyber Monday” came from the observation that millions of working-class American citizens, fresh off a Thanksgiving weekend of window shopping, were returning to high-speed Internet connections at work Monday and buying what they liked. Today, Cyber Monday is observed by a mix of 23 developed and developing countries around the world such as Canada, the United States, Colombia and Peru to name a few. 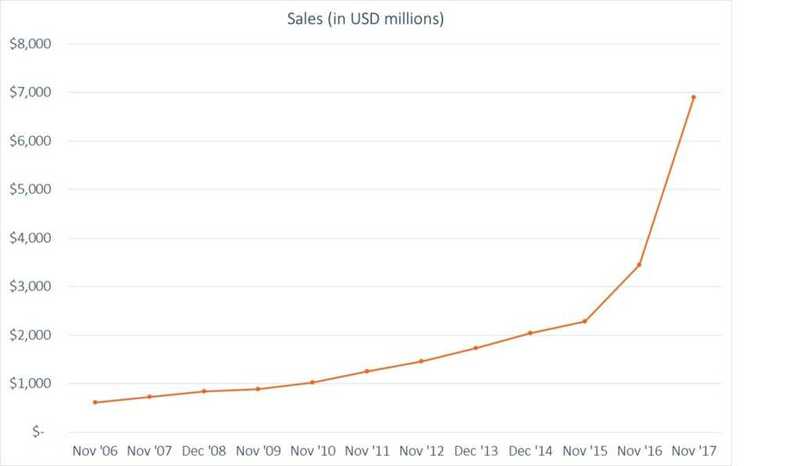 How crazy is Cyber Monday? Growth has been exponential with sales doubling from 2016 to 2017, and with the average spend hovering around $400 per person. The consumer spending can most likely be attributed to online vendors’ drawn-out marketing campaigns that advertise discounts of over 50% and generate anticipation in the weeks leading up to the big day. On a more fundamental level, Cyber Monday’s appeal comes from the convenience of shopping online and avoiding the Black Friday crowds. The 24-hour shopping window also helps with convenience, and some retailers even create multiple day long shopping windows to keep sales up in days following the initial window. Since the Monday following Thanksgiving isn’t a holiday, it is not surprising that 52.7% of Cyber Monday sales originated from work computers. Employers in the U.S. have been cracking down on this, with 7% of surveyed human resource departments having terminated at least one worker due to holiday shopping from work. 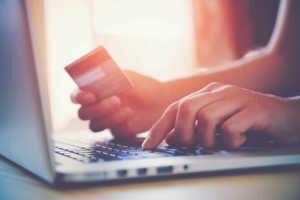 What are the financial implications of Cyber Monday for retailers? Despite generally being a successful sales event, Cyber Monday does carry some risk for retailers. For instance, retailers will need to stock up on inventory – and carrying high levels of inventory can be very costly for a variety of reasons. For instance, storage costs will likely increase, or retailers will have to prioritize warehouse space for items that are most likely to sell. Wage expenses will also rise as many warehouse workers will have to work additional hours in order to deal with the spike in order volume. Assuming that the retailer’s Cost of Goods SoldCost of Goods Sold (COGS)Cost of Goods Sold (COGS) measures the “direct cost” incurred in the production of any goods or services. It includes material cost, direct labor cost, and direct factory overheads, and is directly proportional to revenue. As revenue increases, more resources are required to produce the goods or service. COGS is often and SG&ASG&ASG&A includes all non-production expenses incurred by a company in any given period. This includes expenses such as rent, advertising, marketing, accounting, litigation, travel, meals, management salaries, bonuses, and more. On occasion, it may also include depreciation expense expenses remain constant, it will need to sell upwards of 6 times the number items in order to see increased operating incomeOperating IncomeOperating Income, also referred to as operating profit or Earnings Before Interest & Taxes (EBIT), is the amount of revenue left after deducting operational direct and indirect costs. 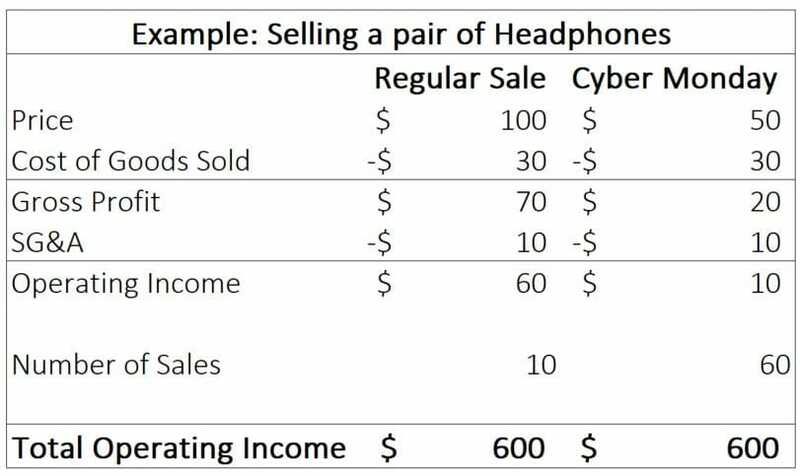 Interest expense, interest income, and other non-operational revenue sources are not considered in computing operating income from Cyber Monday sales. If correctly estimated, the sale can be a great opportunity to increase inventory turnoverInventory TurnoverInventory turnover, or the inventory turnover ratio, is the number of times a business sells and replaces its stock of goods during a given period. It considers the cost of goods sold, relative to its average inventory for a year or in any a set period of time. and make room for new stock. A positive shopping experience may also bring customers back for another shopping trip in the future. cybermonday.com – shows deals from over 800 retailers and will likely show you a deal you won’t be able to resist.